“Voice 1: Howls for Sade, a film by Guy-Ernest Debord. Old Alciphron: Sorry I’m late. I’m always late to these things! OA: … which didn’t tempt you enough, younger one? OA: Anyway, before all that, we were to meet here to talk about the book by McKenzie Wark, The Beach Beneath the Street. YA: Titles that recycle slogans: always a bad idea. But I am ready. OA: As am I, with this sheaf of notes and this annotated copy. Let’s start walking. This way. Well, the first version of the book had a much more interesting title: 50 Years of Recuperation of the Situationist International. YA: Much better. But look, I am impatient (though I pretend not to be when I speak with you). Why either one? Why another book on the SI? OA: Do we know them? From the point of view of our language, the first phase of translation, rendering the texts into English, is more or less accomplished. The majority of Situationist writings have been compiled, many or most images reproduced. There are several archives that collect much of the material, adding commentary and context; there are academic and non-academic anthologies. YA: You are suggesting that translation in other senses, the second, third, nth phases, is unstable and ongoing? OA: Yes. What used to be called interpretation. Look, there have been decades of Situationist-inspired projects, so much so that for some of us some version of the SI is a basic point of reference. But for others, these many entryways are not automatically ways in. An anthology or an archive, so it seems to me, is not a way in; one needs a reason, and the reason itself needs a desire. Faster. YA: Run together desire-reason-need to find a way in, passing through the entryway? YA: So the desire-reason-need complex will eventually show the path one takes through the labyrinth … where are we going? OA: For some of us our projects were the crystallization of that desire, the mark of our interest, our entry into dialogue with others (and, though many of us did not suspect it, with tradition. For example, it was one way to learn to speak Marxish and Hegelese). YA: … so that the theoretical terms that pepper it can be analogous, often enough, to the ones we use. OA: Indeed, I would underline that the use of situationist terms (spectacle, situation, dérive, psychogeography, etc.) decades later and in other places cannot but have something of analogy about it. YA: I imagine there are more analogies to come. The issue in this sort of translation is not one of exactitude, but of metamorphosis. We like what seems off in these terms and people when they mutate what is static in our lives. But that is a condition we set according to our desires. OA: Have I answered your question as to why one might read a book like this? YA: More or less. At least its appearance is a good occasion to stage such questions, because it is in some ways an introduction (corresponding to the latter phases of translation), and in other ways betrays that function. OA: Museum, and hole in the museum’s wall. Stop here. YA: Here – you mean this labyrinth? OA: Well, at its gate. The way in, maybe the way out as well. YA: You can begin by explaining this to me: museum, and hole in the museum’s wall? OA: … and so we return to Wark’s better title. The reference to recuperation would seem to be an irreverent gesture rather than an angry complaint. A shrug in the face of the purists of the group. OA: … or, more speculatively, a spectacular version of some quite ordinary aspect of culture. I mean a glimpse of that aspect of culture that expresses our studied cruelty to the cultures of others – which can be linked with the ‘68 graffito soyons cruels! or Nietzsche’s be cruel with your past and all who would keep you there … wait, was that Nietzsche? OA: … or people. And that lack of urgency, its irreverence, is a good way to describe Wark’s style: though he plays the academic game well enough, he does so with a certain lack of seriousness that, in his terms, consistently allows him to set aside the concepts (and proper names!) of high theory in favor of the incomplete ramblings and failed projects of what he calls low theory. YA: You are going to have to explain that business of high and low theory to me. OA: Take your hands off the stone, younger one; let us step back and gaze upon the gate. Probably the terminology arises through the twin demands of the academic market and the crude pragmatism of those we could call practitioners (activists or artists, for example). If I am right about this, high theory would be whatever intellectual mode can claim some mixture of prestige and in-fashion status in the academic world at the moment, along with the canon this mode suggests. OA: Sure, but let’s remain in his schema for now. Low theory could then be either the popularization of high theory in increasingly diluted, applied forms; or, more interestingly, it could be something else entirely, a way of theorizing that not only fails to be high theory, but does not attempt to qualify as such. YA: Outsider theory, street theory; non-academic, or at least not primarily academic. YA: According to this schema, most if not all of the theoretical works produced by anarchists (and situationists, supposing there are any) today would have to be classed as low theory. OA: Naturally, no? This is especially interesting when we consider how many of these works propose a way of thinking and living that is to some degree impossible. YA: Yes, and how that impossibility, rather than being solely a source of frustration for writers and readers, acts as something more on the order of an intimate, vital challenge, a lure for feeling. YA: For that to be clear, we would have to know who Wark is addressing in this book. For my part, I am not sure. I am not sure he is sure. OA: Yes, that is why I have to invent ideal first-time readers for him. YA: Well, if I follow what you said a minute ago, he certainly develops Situationist terms and concepts in a satisfyingly low way, by which I mean: not enough of a definition to satisfy a theorist; enough to get a creative mind going in an interesting direction. YA: Low theory would have to sabotage that schema, or result from its sabotage. Let’s come back to theory and its terms on the other side. We are still in need of a way in. What about Situationist people (since we won’t have the problem of wondering whether people can be put into practice)? YA: … and later too. It is hard to find the story of Debord as pope here. He is rather a secretary, writing letters to and about practically everybody. OA: I noted that, although he does not place Debord at the center of his narrative, Wark does not criticize him for the practice of exclusion, which would be, for some, evidence for his own sense of centrality. YA: It is a qualified explanation. Writing that he does not think there was one SI changes the status of exclusions. OA: Listen to this part: “Situationists were expected to know what was expected of them and without being told. Debord’s policy as secretary was ‘to place a priori confidence, in all cases, and only until the first proof to the contrary, in a certain number of recognized comrades, based upon objective criteria.’ The reason for most exclusions is not mysterious. It was a failure to live up to expectations. Members are what they do: ‘No problem in our collective action can be resolved by good will.’ A certain unsentimental understanding of how friendships form and dissolve, of how character becomes different to itself as it struggles in and against time underlie the distinctive quality of Situationist subjectivity, where ‘neither freedom nor intelligence are given once and for all.’” Repeat: in Debord’s SI, exclusion was perhaps related more to a certain understanding of friendship than to the leftover habits of communist parties and groupuscules it is usually connected to by commentators. YA: I would rather not be friends with someone that places his friends in such double binds! OA: Your preferences or mine aside, what could be more common? Driven, intense people are often this way – nothing “sinister” about it, as Wark puts it. For a party in power, or seeking power, to exclude is indeed sinister. For a group such as the Situationist International (or some version thereof) to do so is another matter entirely. Wark aptly calls them “a provisional micro-society”: something between a political group and a band of friends. OA: In any case, some people make friends for life, and others don’t; some friendships end well, and others end badly; and to the degree that some of that is done freely, I prefer to understand this as one of the many uses of freedom in friendship, rather than encroaching on them, even by criticism. YA: So that would be one example of the openness of Wark’s irreverent approach. OA: Yes. It is ultimately pleasant to think that this might be a sign that there are now many ways into learning from the Situationists. For example, in decentering Debord, Wark also revokes the status of Society of the Spectacle as the defining text of Situationist theory. I consider it a good thing that people might now begin with something other than Society of the Spectacle. For all its interest, this attempt to give the movement a theory text (or to invent a movement by writing one, in classic socialist/communist fashion) is done at the cost of the expulsion of the idea of situation, probably so as to give center stage to the by now clearly dubious political proposal of worker’s councils. YA: So you are celebrating the decentering of this book? I haven’t read it yet. YA: What about the other one I always hear about, The Revolution of Everyday Life? OA: Well, Vaneigem barely appears in The Beach. It is less clear why – probably, whereas Society of the Spectacle has too much of a high theory agenda, Revolution sets too much of a unilateral tone. You know, the younger generations … whatever one ultimately makes of these decenterings, they are also ways to undo some of the binds and knots that we have inherited from the Situationists and their interpreters. YA: I think it is the nightmare of some to consider that they come together with their interpreters. OA: Ha! 50 years of recuperation! OA: … in some sense even the little betrayal that is in irreverence can be a way out for which we will be grateful should the labyrinth grow tiresome. YA: But now I am imagining two labyrinths: their time, and ours. OA: Which suggests that we are ready to pass inside. Let’s be silent for a while. YA: It is very dark in here. OA: What have you been thinking about in the dark, younger one? YA: Wark devotes the bulk of The Beach to discussions of everyone-but-Debord. But one could also say that the first marginal situationist in Wark’s book is … Guy Debord. YA: In their company, before there was a group, or before the group had a name, ideas and experiences were exchanged, friendships and enmities bloomed. YA: And that togetherness is something other than politics or community. OA: And love affairs? Wark describes Michèle Bernstein’s novels All the King’s Horses and The Night as détournements of F. Sagan and A. Robbe-Grillet, then-popular novelists, and at the same time versions of her relationships with Debord and others. Love triangles, and so on. YA: Gangs … different sorts of knots and binds? OA: Wark makes this an opportunity to briefly broach the subject of sexual politics, and maybe there is something here to meditate on: when the inevitably narcissistic novel of one’s life, that novel we are all involuntarily writing about ourselves, is to be written out, it might be desirable to take a detour through the spectacular presentation of another’s life. YA: For me, that there were two novels based on the same events is perhaps the remarkable, rebellious point in all that. OA: Rebellious writing? What about Alexander Trocchi’s collective writing project, sigma portfolio? OA: I don’t know either. Some kind of duplication, ditto machine. YA: You have certainly memorized a lot of this book! YA: An appropriate complement to your earlier statements about friendship and exclusion. But I thought that, overall, the discussion of Asger Jorn’s theoretical contributions in The Beach is confused. YA: It seems to me that the bulk of Wark’s case for low theory rests on what he says about Jorn. YA: Why all these lengthy quotes for this guy? YA: Hmmm. All of this will take some rumination. Wark assumes we have a stake in the outcome of Marxism. You might; I don’t. OA: But there are analogies to be made with anarchist theory as it exists and to come, no? Think it over. Also, as with the two novels, it’s not trivial that he made such bizarre paintings while writing all this stuff. We’ll talk about it later when you’ve had a chance to see them in good lighting. Constant? YA: Architecture set in motion, pliable architecture, allows the events of life, no longer mere psychological effects, to be primary! OA: Dynamism seems to make us raise our voices! Jaqueline de Jong? YA: She appears most dramatically with the Second Situationist International, “a rival and a replacement” for what was, for them, the “First” SI. Their journal, Situationist Times, was an alternative to Internationale Situationniste. In their founding document, one can read: “now everyone is free to become a Situationist without the need for special formalities.” I loved that. OA: So maybe you have an opinion on this matter of exclusions as well? YA: No, that is their business. But I prefer to do things without special formalities. OA: Schizo, that reminds me … Chtcheglov? OA: Our dialogue is lunar, no? I believe we have found our way to one of the exits. YA: Let us pass through the hole in the wall, older one. YA: It is bright here, or at least brighter. And I am the one who asks the questions now, older one! You are the one who knows something about these terms that are more concrete than ideas, less precise than concepts, and I want to see what news you learned in this book of Wark’s. My list is short. Decomposition? YA: … or as we notice things are falling apart. And then still taking things apart, but in other ways and for other reasons. YA: But somehow the situationist can get into decomposition and operate within it, push it farther? Tiger cats are not just sad, they are also funny. They are dialectically reversible to cat tigers, mini-tigers, suggesting the power of the small and the weak … Yes, I see. This decomposition was to be pursued “to the limit.” I like that. Dérive? OA: From the journal: “A mode of experimental behavior linked to the conditions of urban society: a technique of rapid passage through varied ambiences.” Wark supplements this with the memory of your friend Chtcheglov, his part in the invention of street ethnography; this wandering or drifting around urban spaces could be understood more precisely as a discovery of lived time. This is time devoted neither to work nor to leisure. The time of the non-working classes. YA: The time of research … of low theory. Situation? OA: Well, you know, “A moment of life concretely and deliberately constructed by the collective organization of a unitary ambience and a game of events.” As you might have heard, part of the polemical function of this definition is to replace the concept of the artwork as commodity. But Wark suggests that in the background of the polemic there is also an engagement with the idea of freedom. He helpfully contrasts Sartre’s use of the term situation: “Sartre … famously makes the category of freedom a central one, but in so doing [has] a sly recourse also to the category of situation. That which is for-itself, consciousness, presupposes something external to it. ‘There can be a free for-itself only in a resisting world.’ It is because of the intractable physicality of things that freedom arises as freedom.” But the situation as defined above does not distinguish between consciousness and what is external to it. YA: Which perhaps explains the attraction of the adjective unitary for some of these folks. OA: To construct freedom, construct situations: micro-worlds, provisional micro-societies, in which the obstacle and what it blocks are simultaneously transformed. OA: It is a telling aspect of situation as a low-theoretical term that it includes a hidden reference to, and correction of previous high-theoretical concepts of, the supremely recuperable idea of freedom. And? YA: Oh, what the hell. Spectacle? YA: … Debord aiming in Society of the Spectacle at a concept worthy of high theory, so you have suggested. YA … this term, so it would seem, has a different status. OA: The first three already belong to low theory. Almost no one cares about them. This last one will have to be re-appropriated if it is to be of use. YA: As long as re-appropriated does not suggest the mastery that is high theory’s concern. I think rather of setting it adrift, along with all the others. YA: Rights: the museum. Experiments: the hole in the museum’s wall. Where else? YA: The city and the archive … well-positioned wastelands, they said. 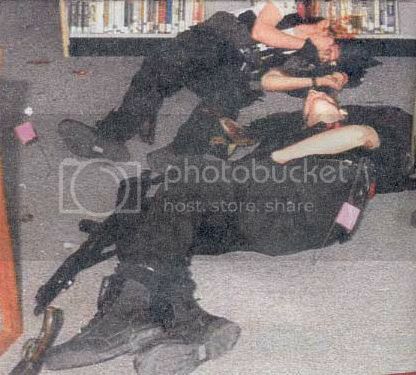 But they are dead. Who is there now, in the dérive? OA: In some exemplary and dangerous sense, we are. In another sense, we only find a mask, that of translator or researcher of low theory. In a third sense, no one is there. YA: What am I supposed to do with that answer? I am going back into the labyrinth. I want to see if the way in is also a way out. Wherever I come out, I guess I’ll go visit the Occupy thing after all. But I am going to be late. In a sense they foreshadowed what was to come, in their own sad and skeptical way, which led them one by one to the abyss. Tiqqun was a two volume journal published in France at the turn of the 21st century. 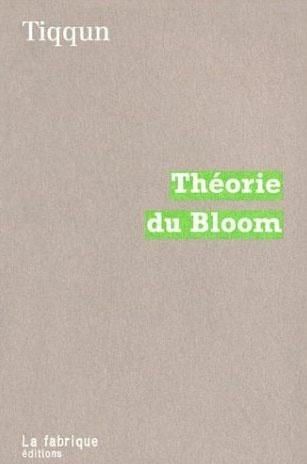 The first volume appeared in 1999 and included a text entitled Théorie du Bloom. In 2000, the text was augmented by the authors and published by La Fabrique Editions. 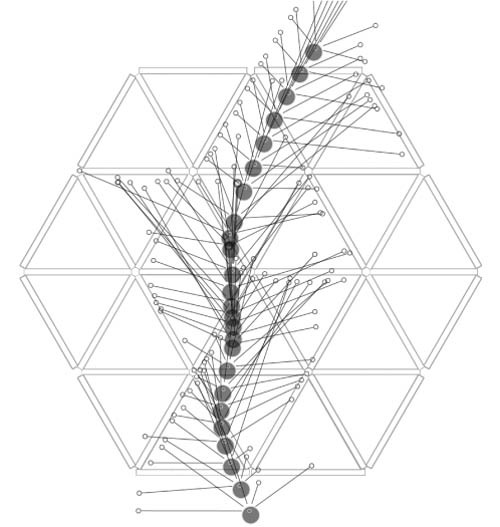 In the two volumes of Tiqqun, the idea of the Bloom appears throughout the interrelated texts. Its clearest articulation resides in the augmented, book-length version of The Theory Of Bloom. The book begins by narrating a scene of total, entropic disconnection between passengers on a train. A woman yells through the phone at her ex-husband, the two of them negotiating time with their child and time with their respective boyfriend and girlfriend. While she talks she is propelled forward on a train, sitting in a seat identical to all others in a car which is identical to all the others. The detachment of everyone on the train, the “strangeness” between them, is something we all share in common. This “strangeness” is also called the Bloom. We only experience it as a “strangeness” because we are so separated and so masked to one another. But in fact, the Bloom is the common power we all share. Bloom is the name given to the nameless. From there, the book dives into the history of the 20th century, narrating the development of Biopower from 1914 onwards. Biopower, the science of control, is the “ benevolent power, full of the solicitude of a shepherd for his flock, the power that wants the salute of its subjects, the power that wants you to live.” Working hand in hand with Biopower is the Spectacle, “the power that wants you to talk, that wants you to be someone.” You must have a social role in the Spectacle, you must be recognizable and clearly distinct so as to be better classified in its shows, magazines, soap operas, social scenes–its theater of masks. As Biopower and the Spectacle’s control grew more total in scope and effect throughout the course of the 20th century, the Bloom had to survive and adapt. It had to exist with the bombardments of the radio, the television, advertisements, moral duties, mandatory military service, and the conditions in modern factories. But soon, the Bloom caused the strategies of Biopower to shift. Too many people concentrated together would produce too much resistance. The common ground had to be pulled out from under the Bloom. The workplace had to be diffused, more and more had to become automated, and the workers had to be stripped of their collective power. By being made easily replaceable and anonymous, workers fell deeper into the grips of Biopower. At the same time, the worker became disinterested in crumbling truths regarding living wages, job security, and fair employment. All ties the Bloom once had to economy started to fade, and are still fading. KEEP A GOOD FACE, before the domain of ruins. The Bloom is forced to fixate on certain social roles in order to survive. Worker, housewife, professional, student, citizen, all of the roles are but masks, donned and rarely removed. The Bloom must remain positive while wearing these masks, ignoring its own power and sovereignty. “The Bloom is the masked nothing.” But underneath the mask is the pure potential of every person. Only those who know the meaning that they will give to the catastrophe retain calmness and precision in their movements. By the type and the proportions of panic to which a spirit allows itself to go, one can tell one’s rank. The goal for the reader is to understand the context and significance of their situation, to not run in terror from their pure potential, their total freedom. They recommend experimentation, massive experimentation in which the reader detaches themselves from their detachment “using a conscious, strategical practice of dual self.” In this way, one becomes part of the Imaginary Party, the anonymous sea of actors who cannot help but hinder the movements of civilization. But rather than be a hipster or a school shooter, the agents of the Invisible Committee move anonymously through their environs, composing strategically within a collapsing system, refusing to be frozen in popular culture or sacrificed to the Spectacle as a psychotic killer. To embrace the Bloom in oneself is “the practical experience of the self as trickster.” Everything which exists in the world of the Spectacle and Biopower can be utilized but must never be embraced or championed. It is all at our disposal, every bit of it, ready to be re-appropriated. “To not only survive in the constant immanence of a miraculous departure, to not merely force oneself to believe in the job that one does, in the lies that one tells, but to begin from there, to enter into contact with other agents of the Invisible Committee.” The Invisible Committee is “an openly secret society, a public conspiracy…the name of which is everywhere and the headquarters nowhere.” All defectors, all deserters, all escape artists can take part in the “inassignable plan” of the infiltration of every echelon of society. The book ends by telling the reader, very simply, to leave the rank “without appearing to.” The authors tell the reader when to do this. NOW. The Theory of Bloom is a very dangerous book, filled with warnings against fascism, laziness and stagnation. It describes our era as one whose defining characteristics are display, finitude, and solitude. We display ourselves to each other because it the only way to be seen. We are finite beings, forever sealed off from each other, only able to display our masks in a grand masquerade. And we are all alone, solitary, stumbling over each other when the dance is over and the masks have grown uncomfortable. In times of decadence, people get to the bottom of things, growing disgusted and tired with their masks. We are all orbiting around the gravity of our potential power, unsure of and afraid to use it. But that power is not something which only one group may access. Fascism is simply another response to glimpsing ones power, ones pure potential. Fascism is the mass-experience of freedom as death. It is a very real, ever present danger. The book is terrifying in its simplicity, nearly overwhelming in its descriptions of modern culture. The fact that it was written over a decade ago is a testament to the resonance it still carries within it. There are dozens of passages describing familiar scenes which still hold true today and are no less potent because of their age. This book is one of the main keys to the two volumes of Tiqqun and the later work of the Invisible Committee, The Coming Insurrection. It holds everything which was to come later, and contains to seeds of what is still to be sown. This book should be read and read again. Evidently, it has no other end but devastating this world; this is even its destiny, but it will never say so. Because its strategy is to produce the disaster, and around it, silence.